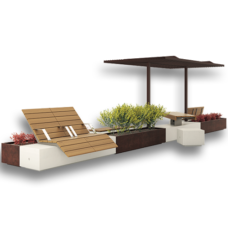 Merenda | id created, Inc.
Merenda pic nic table and bench is made in your choice of powder coated steel or corten steel with Anti-Washout treatment, with seats with or without Ipe wood. Choose desired length: 840mm, 1480mm or 1990mm. If applicable specify standard color or provide 4-digit RAL for powder coated steel supports. Surface mount: anchors not included. Add options: Anti-Grafitti treatment and zinc rich TRIPLEX primer available for powder coated steel. Anti-Washout treatment for corten steel upon request.